With the Hexagon 4.5.4 SF, originally Brown & Sharpe , you can literally bring your inspection to where the parts are made. 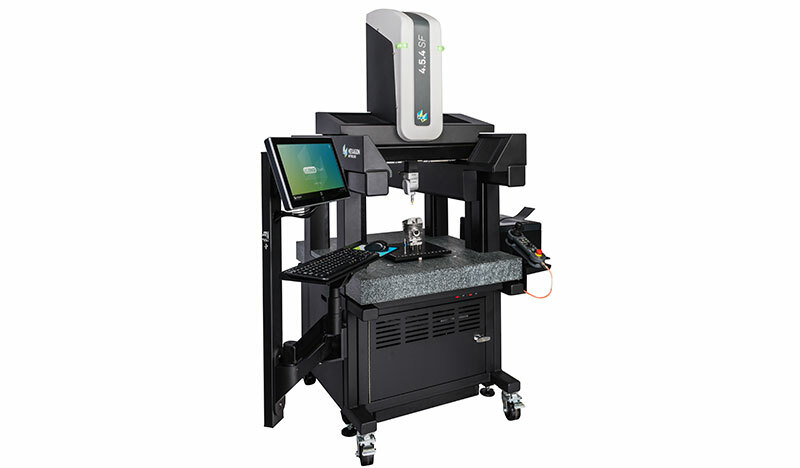 This powerful and innovative CMM features a LSP-X1c probe and a compact footprint, which allows it to be placed almost anywhere on the shop floor. The 4.5.4 SF is ideal for machine shops and manufacturing cells - featuring advanced thermal compensation, covered ways, built-in vibration resistance, shop-hardened design, and optional analog contact scanning. Among a long list of features, the most notable benefit of this rugged CMM is its flexibility. The Brown & Sharpe 4.5.4 SF uses standard 110/220 volt outlets, with no need for shop air. It also has a compact footprint and roll-around stand, specifically designed to fit through a standard door. Therefore, it lets you easily move the SF series anywhere in the shop where precise dimensional inspection is required. In addition, the 4.5.4 SF integrates advanced thermal compensation to adjust for shop floor temperature gradients and includes a Message Light System to alert users of errors that may occur. Economical to own and operate, with low up-front cost and simple maintenance, the Hexagon 4.5.4 SF is every user’s dream.